PMSG is dissolved in sterile water to make 2500 U/ml and then further diluted 1:10 with Ca2+, Mg2+ free Ringers, resulting in a concentration of 250 U/ml. First Prime Females with 0.2mL PMSG around 9AM. Leave the frogs at room temp during this day. Inject the frogs just beneath the skin of the thigh area. Second Prime with HCG around 5PM. Leave the frogs in the 16°C incubator overnight. The amount of HCG needed varies throughout the year, with less needed in spring and early summer (0.25-0.3mL) and more (0.3-0.4mL) during the autumn and winter months. The optimal amount is determined by empirical voodoo. Resuspend vials of HCG in 10 mL sterile water, and store at 4°C. Females should begin ovulation the following morning. Good signs are eggs discharged into the water and red swollen genitalia. Harvest testes. Anesthetize a male by placing into a 1 liter beaker with around 2cm of 10% benzocaine stock plus water to around 800mL. (The 10% benzocaine stock is made in ethanol). Cover the beaker with aluminum foil to prevent escape. Once completely sedated, make an incision from the groin to the middle of the belly, then make a horizontal cut on either side. The testes are white, kidney-shaped and associated with large orange-yellow fat bodies. Carefully dissect the testes away from the fat bodies without breaking them. Store them covered in testes buffer at 4°C for about two weeks. Harvest eggs by gently squeezing the female, collecting the eggs in a petri dish. Cover them with 33% MRS.
Fertilize the eggs by ripping up a piece of a testis in their dish and swirling gently. Allow around 5-7 minutes for fertilization. Dejelly the eggs. Carefully pour off as much of the MRS as possible. Add 40 mLs 2% cysteine pH 8.0 made in either 33% MRS. (0.8 g cysteine per 40mLs plus 6-8 drops NaOH). Cover the dish and swirl until the embryos are dejellied, about 3 minutes. Do not keep the embryos in cysteine any longer than necessary. Important note: From this point onwards, it is vital to keep the embryos submerged in liquid at all times, including during the following washes. Once their jelly coat is removed, they will burst if removed from liquid. Wash by pouring off as much cysteine as possible, and carefully adding 20% MRS. Swirl gently and repeat 3 or 4 times. Incubate embryos at 16°C until after gastrulation. They develop more rapidly at room temperature but will frequently gastrulate abnormally unless kept at 16°C the first night. Injections are performed in agarose injection trays or using plates with mesh attached to the bottom. Transfer a row of embryos to an injection dish filled with 100-5 (100% MRS-5% Ficoll). Inject 10 nL per embryo, so dilute mRNA or DNA appropriately. Many mRNAs are injected at 100-500 pg per embryo, but this can vary widely depending on the gene. 100pg/10nL = 0.01 µg/ µL final concentration. Rinse Hamilton syringe with chloroform, followed by DEPC-treated water. Back-load 2-3 µL RNA into injection needle. Mount needle into injector . Break off the extreme tip of the needle using forceps. Calibrate injection volume by setting gas pressure to 10, injection time 0.2 seconds. Start with the center brass knob open 1/4 turn, and both others somewhat open. Inject a pulse into parafin oil, measure size of the bubble with the ocular micrometer. 7 marks at 25X ≈10 nL, which is a good volume for 1-4 cell injections. Adjust knobs, injection time, and pressure to give the desired volume. I usually inject the embryos at 12x magnification. After injection, transfer the embryos to a fresh petri dish with 20-5 (20% MRS- 5% ficoll). Leave them in this for at least an hour and then replace the 20-5 with normal 20% MRS and store at 16° until after gastrulation. Embryos left in 20-5 or at room temperature the first night will often gastrulate abnormally. Remove dead embryos often and give fresh 20% MRS every day. bring to 1 liter with MiliQ water. Dilute this stock 1:5 or 1:3 to make 20% and 33% MRS solutions. 10% fetal calf serum in 1x Ringers + 50 µg / mL gentamycin. Treating Sick Animals (Red Leg): Isolate any sick looking animal in a tank (or bucket) that has an increased concentration of salt (e.g., use 100% Holtfreters instead of 20%). Inject sick animals every three days with injectable enrofloxacin (Baytril), for a total of two weeks. The does is 10mg/kg or 1 mg dose for a 100g adult female. The injection site is subcutaneous in the armpit area. One precaution we take with new animals is to inject them with one dose of Baytril upon receipt. For prick activation experiments, dejellied eggs were positioned in small wells made in agarose plates (2% type V high gelling temp., in 1x Ringers). They were pricked quickly using a micromanipulator with a clean glass needle while held in a solution of 5% Ficoll in 20% Ringers. Inversion experiments were done in the same Ficoll solution. Dejellied fertilized eggs were inverted gently with forceps 180° and held in wells on agarose plates. 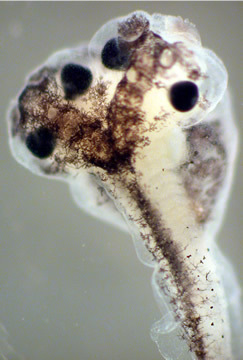 Inversions were complete by 30' post-fertilization, and embryos were left to develop upside down throughout the experiment. The calcium ionophore A23187 was used for ionophore activation. Dejellied eggs were placed in a solution of 10mg/ml A23187 supplemented with fetal calf serum. Activation was confirmed by observing the slow contraction of the animal pigment cap at approx. 10'-15' post-fertilization and the upward rotation of the animal hemisphere. Eggs were transferred to 20% Ringers to develop for the remainder of the experiment. Both oocytes and fertilized eggs are injected in "wedge plates" made from 2% agarose (Sigma, Type V). Injection plates can be washed after use and reused many times. Oocytes and eggs are injected in 5% ficoll in 100% Ringers. After injection, oocytes are transferred to normal, ficoll-less media. Embryos are transferred to 5% ficoll in 20% Ringers. Embryos should be transferred to 20% Ringers between stages 5-6. Remember to check the tubing pieces inside the manipulator and replace them if they become clogged with glass chips. Avoid scraping the inside of the glass needle with the Hamilton syringe when loading it. Tiny pieces of glass could clog the needle. Natural Mating: You can have a natural mating to raise tadpoles if you are interested in expanding your colony. To do this you must inject both the male and the female. You should inject the male with 50 U HCG(or 50 U PMS) and inject the non-PMS primed female with 750 U HCG. Put them in a 5 gallon bucket together and allow them to remain together overnight. You should do this at the end of the day so the lab will be quiet throughout the night and the frogs are not disturbed. If possible place egg crate at the bottom of the tank to keep the frogs away from the eggs. This will prevent the eggs from being eaten before you separate the couple. The next day, collect the eggs by sucking them up in a pipette and placing them in 10% Holtfreter's solution. We've had the best luck when we dejelly the eggs with 2% Cysteine and then keep them in 10% Holtfreter to which Gentamicin Sulfate (80mg/liter) has been added. Tadpole care: Keep tadpoles at room temperature in 10% Holtfreters. Replace solution once per day and feed with 'Tadpole Slurry' in the morning. I add a teaspoon of the slurry for every 500 ml. 100% Tadpole Slurry: To make 100 ml of slurry, add 1 tablespoon of Spirulina power and 1 teaspoon of Brewer's Yeast, mix and keep at 4C.